MailServe sets up a totally buzzword-compliant mail server on Mac OS X, the Mac Way. It sets up SMTP, UW/IMAP & POP3, and Fetchmail services, including support for SSL and SMTP authentication. Note: If you need support for nested IMAP sub-folders, you'll need to use Dovecot rather than UW/IMAP (which only supports one level of IMAP folders). 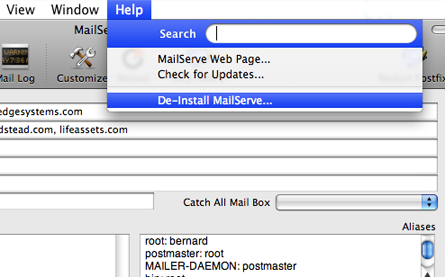 Please check out MailServe Pro, which includes a one-click install of Dovecot. New! 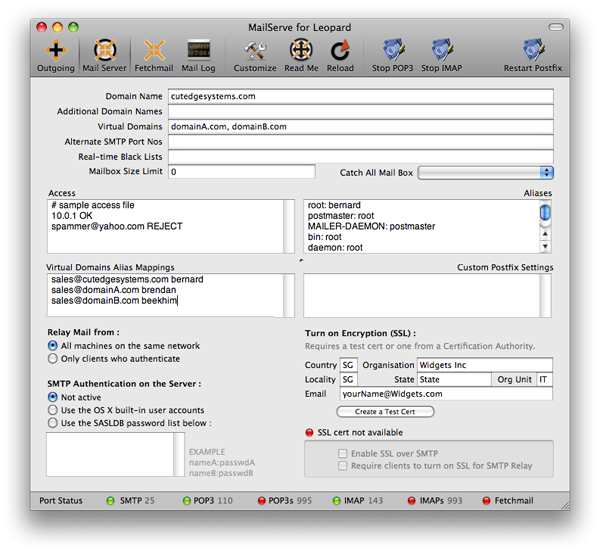 MailServe for Snow Leopard. MailServe can now also be configured from a non-admin account. Simply provide either the full name or the OS X short name of an admin-level user and the administrator's password. MailServe's customizable toolbar includes panels for setting the outgoing SMTP server parameters, the full mail server preferences, Fetchmail settings (if needed), and access to the mail log. 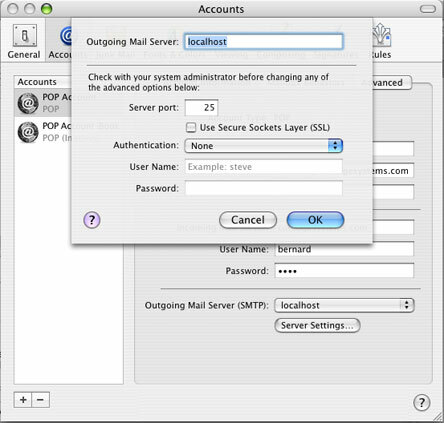 There are separate buttons for turning on POP3 and IMAP, with or without SSL, in case there is a need for enforcing SSL-only connections from mail clients. There is also a new Port Status bar at the bottom of the window, to give a visual indication as to whether MailServe has successfully opened up the relevant ports for listening to connections. 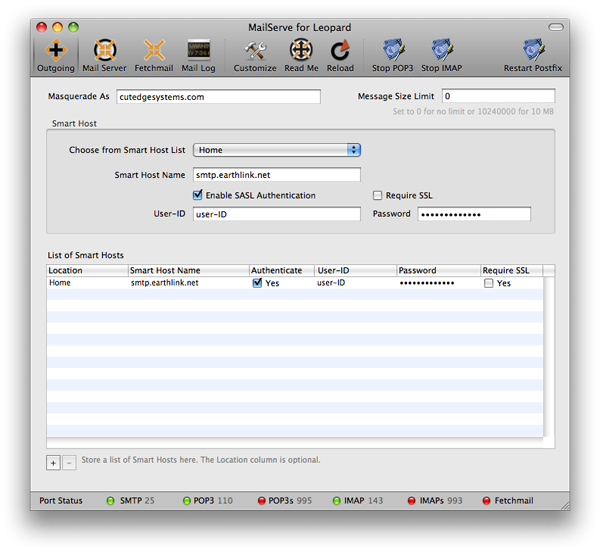 Click the Start Postfix button on the toolbar to turn on Mac OS X's built-in SMTP server. This will allow you to send mail out the command line, from PHP or Perl scripts, or from mail client applications like Mail, Eudora or Entourage. If Postfix has been successfully started, its toolbar button changes its label to Restart Postfix, and the Port Status bar lights up for SMTP port 25. You can always Stop Postfix by option-clicking on the toolbar button. If your ISP blocks port 25 and requires you to go through their own SMTP server (what is called a Smart Host), enter their SMTP server name into the Smart Host Name field (otherwise leave it blank). Your built-in Postfix SMTP server will then contact this Smart Host and relay mail through it. If your ISP requires that you connect to their SMTP server over SSL, turn the Require SSL check box on. After you've made any of these changes, click the Restart Postfix button to effect the change. Then test that you can now send mail out your ISP network, by sending mail out via the command line, PHP or Perl script, or from a mail client like Mail or Eudora. Make sure that the port status light for SMTP is green. If you do get a connection and can send mail out, you might like to add a couple of other refinements. If you want your message to look like it's being sent from a particular domain (and avoid the "May be forged" headers that some ISPs' servers tag onto it), enter that doman name into the Masquerade As field. The Masquerade As field is particularly important for PHP programmers using PHP's built-in mail function. Enter a domain name into the Masquerade As field that corresponds to to the e-mail address that you want all replies to come back to, and you will find that your messages will get to their destination safely from the PHP scripts. Without this, the messages will get rejected. The last field on this panel is the Message Size Limit. Set to 0 for no limit. You can use MailServe to set up POP and IMAP services so you can become your own ISP - see the topic concerning the Mail Server panel, below. To use use your own built-in SMTP server, set the mail client application's Outgoing Mail Server to either localhost or 127.0.0.1, as shown above, and that's it. Make sure that the Authentication pop-up menu is set to none because you don't need to authenticate with your own built-in mail server. Note for MacBook users : You may like to know if a large attachment has been sent out your machine, so you can close your MacBook lid. Look into the Mail Log panel and check for a log entry that indicates Status=Sent for that particular message. Warning: If you're only going to send mail out and not intending to set up a full-fledged mail server (see next section), do not use the Mail Server panel because the settings for the two situations are slightly different. Specifically, do not enter a domain name into the Mail Server panel because that will cause Postfix to hold on to mail that are addressed to people on that domain, rather than sending them out. 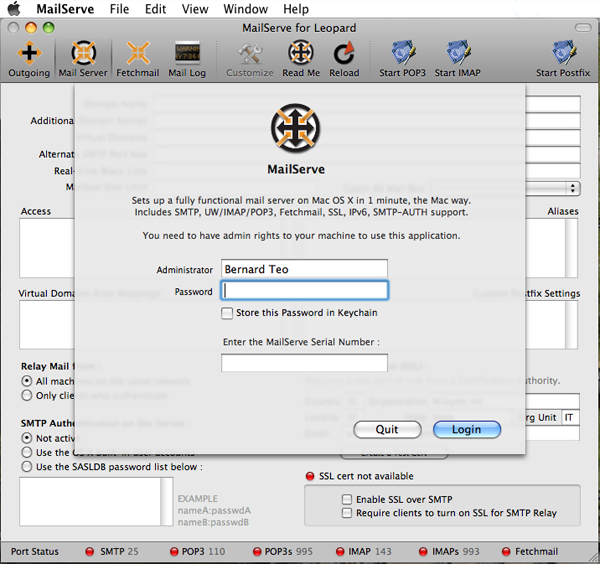 MailServe can be used to set up a fully functioning mail server, complete with POP3, IMAP, and Fetchmail services. Workstations on the local network can use this server to relay mail to each other, as well as to send them out to the rest of the world. This section describes how you would set this up. First, make sure that you've already been able to send mail out successfully to other mail servers. If not, please review the earlier Outgoing Mail panel. Make sure you have a valid domain name and that it is pointing correctly to your server machine. If it is, enter it into the domain name field. In the example above, my domain name is cutedgesystems.com. Once you've done this, click on Restart Postfix, and that's it. I've set up a mail server for the domain cutedgesystems.com and all machines on the same network as the server can send mail through it. Multi-domains Note : If you're able to serve out more than one domain on your server, you can tell your mail server to receive mail from those other domains by adding their names into the Additional Domain Names field. Please note : When you're setting up a mail server that is accessible by the rest of the world, you must have a valid domain name. Check out this tutorial if you want to try this out using a free domain name. You need to check that the domain name works. The simplest way to do this is to turn on the web server on the same machine you are using to run your mail server (using OS X's Sharing Preferences). Then, fire up a web browser, like Safari, and see if you can hit the web pages that you know you have on this machine. It's important to realise at this point that you need to set up user accounts on the mail server to collect (and act as distribution points) for the in-coming mail. 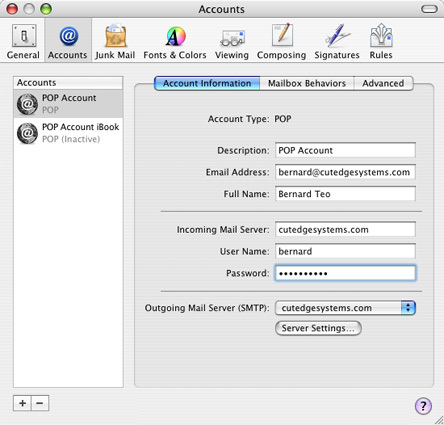 To create an account for a mail user, simply create a New User on that server machine using the System Preferences -> Accounts panel. You can set up both POP3 and IMAP services using MailServe and have both running at the same time, allowing your users to choose which service they prefer. Leave all the other settings alone and click on the Start POP3 or the Start IMAP button on the toolbar, depending on which mode of mail service you prefer to run. If the services start up correctly, their status lights turn to green and their button labels now show Stop POP3 or Stop IMAP, respectively. Enter your domain name into your mail client's Incoming Mail Server and Outgoing Mail Server fields. The User Name and Password fields will correspond with the name and password of a user you had created using the Systems Preferences - Accounts Panel on the server machine. 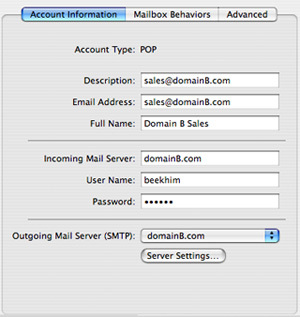 (If you've enabled the IMAP server, you can also use the Account Type: IMAP). When you are ready, use Mail to send mail out to anybody you know and see if you can get a reply. The replies will come back to the same server. You can pick them up using Mail because MailServe has equipped your server with POP3 services. Ordinarily, there is no separation between users into particular domains. For example, on my server, mail for bernard@cutedgesystems.com and mail for bernard@roadstead.com will both reach me in my single mail box on the server, under the user name bernard. To get mail for sales@cutedgesystems.com and sales@roadstead.com sent to two different mail boxes, see the Virtual Domains example, below. Clicking on the "Relay Mail From : only clients who authenticate" choice will close up the open relay. If you need to still allow mail relay from known users, turn on authentication. This will be the safest option. You can also use this field to open more ports for other mail servers to contact your server, to deliver mail to it. For example, you may be attempting to set up a mail server on a network whose ISP blocks incoming port 25. This way, no other mail servers will be able to deliver mail to your server. There is a way around this, that people using DynDNS.org's MailHop feature (for example) have expoited. But you need to open an alternate port that MailHop can use to contact your server (check the dyndns.org example). Set this port number in MailServe's Alternate Port Numbers (for SMTP) field. Ordinarily, even if you receive mail for two domains - domainA.com and domainB.com - sales@domainA.com will use the same mailbox as sales@domainB.com. But, using the Virtual Domains field, you can make things work a bit differently. This allows the mail server to be accessed remotely only by authorised users, whose name:password combinations have been registered with the server. By default, machines on the local network need not authenticate to send mail through the server. You can force everybody to authenticate (by choosing the "Relay Mail from : Only clients who authenticate" option). This is especially important if you've placed your server directly on the broadband line, instead of behind a router or Airport Base Station, in which case all the other machines on your ISP's network becomes your "local" network! The safest practise is to turn on SMTP authentication, as shown below. The second method, SASLDB, is considered to be more secure because passwords are never sent down the wire, only tokens. If you choose to turn on SMTP Authentication via SASLDB, you will need to provide the server with a list of username:password combinations, for each user who will be needing to send mail remotely through the server. In Mail.app, under Outgoing Mail Server, click on Server Settings and set Authentication to "MD5 Challenge-Response". Enter the username:password combination that was registered for this user on the server. 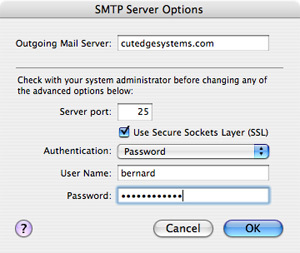 You can turn on or off SSL mode to encrypt the communications between client and server, over SMTP, POP, and IMAP. 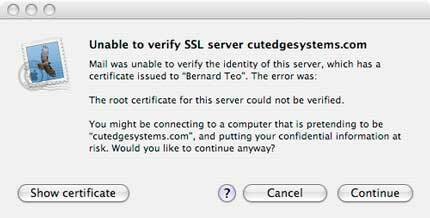 However, you will need to have the appropriate SSL certs in /System/Library/OpenSSL/certs before you can enable SSL. You can create test (self-signed) certs to test the SSL connection to and from the mail server. You can always replace them with "real" certs, of the same name, in the future. You can require SSL be set in the mail client before your server will agree to relay mail for it. Just check the Require SSL option. There is one way to get rid of this dialog box. Click on the Show Certificate button. Drag the certficate icon that you'll see in the top left hand corner of the extended dialog to the Finder. This will create a file and you double-click on it. This will launch the Keychain Access application. Choose X509 Anchors when you're presented with a popup menu. Then import that certificate into the Keychain. This allows you to keep the MailServe interface clean and sparse, showing only the functioons that you do intend to use. Both logs show the most recent entries first, and display the currently running versions of their respective servers. If you option-click on the Postfix Log button, you can get a list of the currently active Postfix parameters set up by MailServe. You should check your mail server machine to see if you have Leopard's built-in firewall turned on. I do not yet know of a good way to set up the firewall because that function seems to have taken a couple of steps backwards with Leopard. In any case, if you find an appropriate Firewall software for Leopard, you should open, at least, ports 25 (smtp), 110 (pop3) and 143 (imap) in the firewall. If you've turned on SSL, you should also make sure ports 995 (pop3 over SSL) and 993 (imap over SSL) are opened. 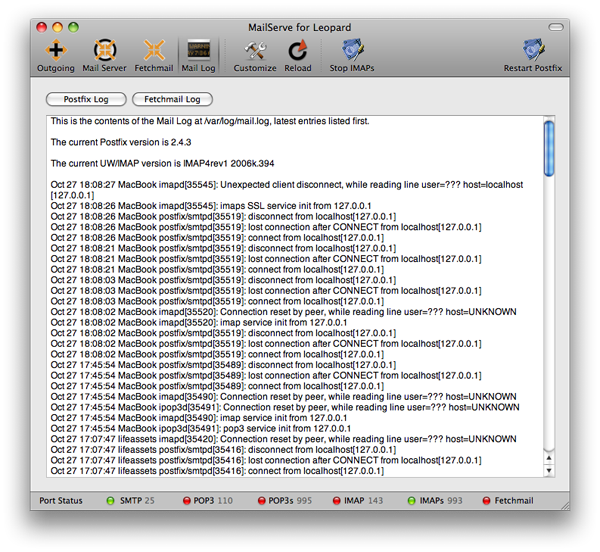 MailServe for Leopard works from its own folder in /usr/local/cutedge/postfix, in which are stuffed the main.cf, master.cf and other files used by Postfix. The original Postfix files in /etc/postfix are left un-touched and so MailServe leaves your system in its original state after de-installation. The Help menu also contains links to the MailServe for Leopard web page and it can be used to check that web site for new versions. MailServe/Postfix Enabler for Tiger serial numbers don't work on Leopard. Please support our work by purchasing a serial number for MailServe for Leopard. Version 3.0.1 fixed a bug with the Postfix Log button in the Mail Log Panel, which had caused MailServe to hang when the size of the log file got too big. Versions 3.0.2 & 3 - systems that were upgraded to Leopard, instead of being clean-installed, may have some mail-related launchdaemons left over from the Tiger install. MailServe for Leopard will now try to disable them if it finds them active while starting up. 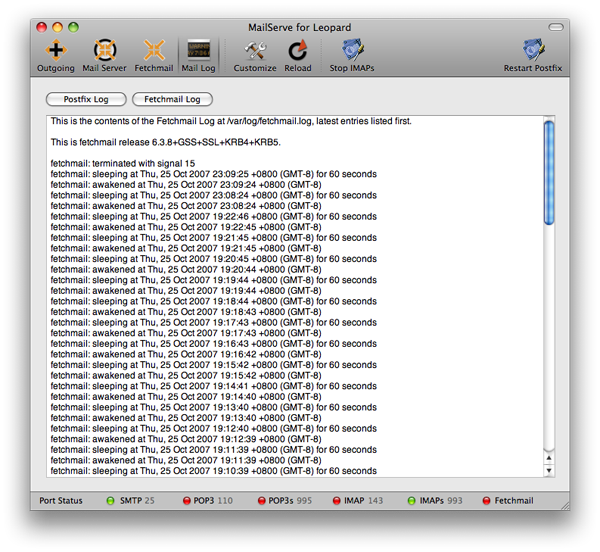 Version 3.0.4 - figured out how to get the Mail Queue feature working again in MailServe for Leopard. You can find the button that displays the Mail Queue panel when you Customize the Toolbar. MailServe Pro for Leopard includes support for Dovecot and the ability to set up custom POP3 and IMAP ports. Dovecot is a high-performance POP3 and IMAP server which is significantly faster than UW/IMAP and supports the creation of multiple nested IMAP sub-folders.